Beautiful You: Blogmas Day 19 | Christmas Jumper Day for TEXT Santa! Blogmas Day 19 | Christmas Jumper Day for TEXT Santa! So as many of you probably know, yesterday was Christmas Jumoer day for Text Santa and the solicitors I worked at decided to participate this year! 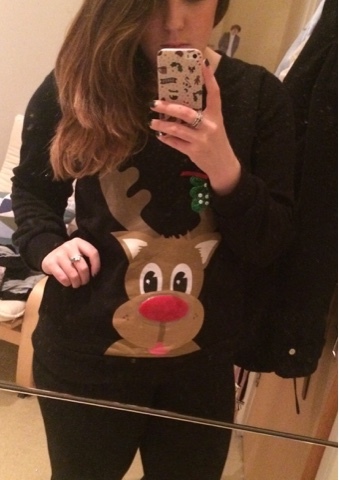 My jumper I wore was from Asda last year, it is a black jersey jumper with a reindeer on. The best part about it is when you tap the nose it lights up and plays Jingle Bells- I made me realised how clumsy I was as it kept going off when I walked into anything!! I just thought that I would share what I wore with you all and if you participated too let me know in the comments what you wore! I'll see you all tomorrow for some festive baking! !